← Han Solo or Indiana Jones? Should Siblings Be Without Rivalry? For Months I’ve heard people recommend this book, “Siblings Without Rivalry”, yet I’ve refrained from reading it. I’ve read pretty much every other parenting book out there, even when the person recommending it parents completely opposite of us. My reason for reading all of them is that even a book or a person I disagree with can help me along my journey to becoming a better parent. When I see someone do something that goes against my parenting philosophy it solidifies in my mind why I parent the way I do. It also allows me a chance to see better ways to approach something similar in my own family. So why did I balk at reading “Siblings Without Rivalry”? A book recommended by many people who parent in a similar manner? Easy. The title scared me. Siblings without rivalry. The words indicate that it’s both possible and desirable to have no rivalry in a home. That initial reaction left me feeling inadequate. My children fight. A lot. Some days I have no idea what to do. Ella chases Agatha around the house while Agatha screams and cries. Agatha follows Ella everywhere, even when Ella’s asking for space so she can calm down – then Ella loses it and hits Agatha. 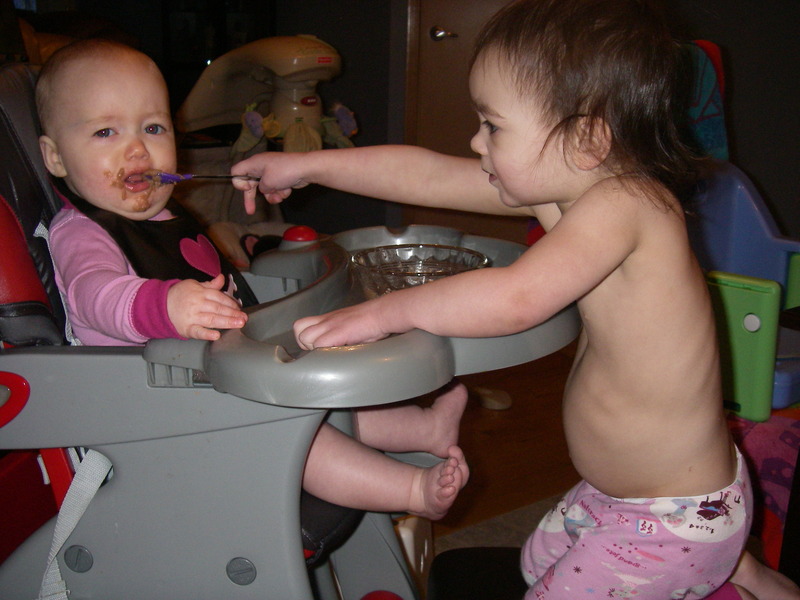 My girls love each other deeply, but they fight – sometimes they’re downright mean to each other. I didn’t want to read a book that indicated my children shouldn’t be fighting – that would mean I was doing something terribly wrong. Put the camera down, and rescue me! Not only do I think I’m doing a pretty good job, but I think rivalry is a necessary part of growing up. I don’t mean parents should create it – far from it. But I think rivalry helps children learn how to navigate social interactions. Though it only provides learning if parents facilitate the learning in the beginning. When they’re little parents need to model ‘fair fighting’. Parents also need to help their toddlers and preschoolers work through disagreements so everyone comes away feeling respected and safe. A toddler won’t know how to ask for a toy he wants and another toddler won’t know what to do when someone takes her toy. As parents we can help them learn how to ask. And how to stand up for themselves without hurting anyone. However, as children get older it’s important for parents to step back and let them disagree, let them yell at each other. Let them learn what happens when they say X, Y, or Z. they’ll find out what happens when they ruin a siblings prized possession. Those were my thoughts. And they haven’t changed after reading the book. I wasn’t sure what to expect, but wanted to keep an open mind. First, I think many of the ideas presented in the book are very similar to their other book “How to Talk So Your Kids Will Listen…”. Second I was pleasantly surprised. They didn’t suggest siblings shouldn’t fight, or even that it was possible to prevent fighting. They did provide ideas on how to support each child so when fights occur children will be able to feel respected and safe. The book also highlight things many parents do that creates further tension between children and greater levels of rivalry. For the most part we already use many of their techniques, but it’s always great to have a reminder. There are also new ideas presented that we’ll try out over the next few weeks to see how things go. I’m going to make a point over the next week to pay closer attention to the girls disagreements and how they resolve. Do they need help, how do I react, was everyone able to feel safe and respected?